Verbs, adverbs and adjectives are all important parts of English Grammar. Read on to see examples and definitions. Verbs are the building blocks of English grammar. The shortest sentences, including one word sentences, include a verb. Verbs are usually described as being “action words”. While verbs do give the impression of actually “doing” something, they can also convey an idea of state, of existence and of “being”. A verb can always be found with a subject. In the following sentence “Richard speaks Spanish”, Richard is the subject, so the word speaks is the verb. Action - Isabelle plays tennis. – The verb here is plays. State – Isabelle seems quiet. – The verb here is seems. 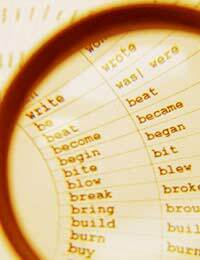 Verbs are a special part of the English language, as they can change their form. Most of the other types of words in the English language such as prepositions, adjectives and so on cannot. Adverbs are the words that tell us more about the actual verb that is being used. It is the adverb that changes the verb, and they can also change adjectives. The main job of the adverb is to give us more detailed information about the adjective, verb and other adverbs being used. Daniel speaks quietly – The adverb in this sentence is quietly, and the word it is changing is speaks. Sarah lives locally – the adverb is locally and the word being changed is lives. The adverbs have many other functions such as changing an entire sentence or changing certain phrases. Don’t think though, that all words that end in –ly must be adverbs. Some words such as “friendly” are actually adjectives. The adverb can be found in three places in a sentence: the beginning, the middle and the end. When the adverb is at the beginning, it will come before the subject. When it is in the middle, it will come between the subject and then the main verb. When at the end of a sentence, the adverb will be after either the verb or the subject. The adjective is the word that will give us more information about the noun. Noun also includes noun phrases and pronouns. Just like the adverbs, the adjectives change the noun. I like Chinese food – “Chinese” being the adjective and “food” being the noun. It is hard – “Hard” being the adjective and “it is” being the verb. This is just a basic look at the ways verbs, adverbs and adjectives fit into English grammar. There are many printed books that go into every aspect of English grammar and how to use it. This overview will give you a good starting point when you start to learn English grammar.